Malta Maritime Directory :: LNG emergency and incident response guidelines for inland navigation are available now. Comment about: LNG emergency and incident response guidelines for inland navigation are available now. LNG emergency and incident response guidelines for inland navigation are available now. Safety around Liquefied Natural Gas (LNG) is a hot topic, now that LNG is more and more becoming the fuel of the future. The results of a recent LNG emergency and incident response study are a big step forward in LNG safety in Europe. Today, the Rhine Port Group hands over the first edition of this study to Mr. Specht, 1st Major of the City of Mannheim and dedicated chief of the fire department. The Rhine Port Group consists of the Port of Rotterdam, the Port of Antwerp, the Port of Mannheim, the Port of Strasbourg and the Port of Switzerland. The document informs emergency response organisations how to prepare themselves to manage credible LNG incidents on inland navigation along the Rhine-Main-Danube corridor. The target group of the study is emergency responders in the inland waterway transport (IWT) sector, consisting of emergency response organisations such as fire brigades and port authorities. This study was executed under the EU-funded project ‘LNG Masterplan for Rhine-Main-Danube'. 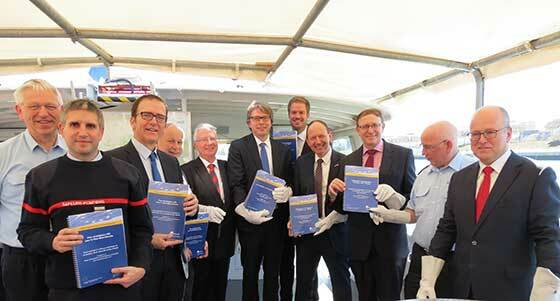 The document consists of two main parts: 1) the desk study of existing technology and state of readiness in the Rhine Ports and 2) guidelines for LNG incident preparedness education and training. Mr. Specht is very satisfied with the results: "This document is of high quality and ready to land at the right spot where the report is needed: at Fire Departments and Port Authorities." The consortium of Falck RISC and the Unified Fire Department was chosen mid-2014 to execute the study because of their specific knowledge of LNG technology and incident preparedness in inland navigation. The study has shown that much knowledge and experience is already available within the EU concerning a high level of safety of international carriage of dangerous goods on inland waterways. It has also been shown that local Emergency Services and Port Authorities are professional organisations and are doing their utmost to prevent any kind of incident with dangerous goods on their waterways. Nevertheless, the recent introduction of international carriage of LNG on European inland waterways has also introduced a new phenomenon for Emergency Services and Port Authorities to be prepared for. LNG is a cryogenic gas that is stored at a temperature of -162ºC, diminishing the volume about 600 times compared to the size of its original gas volume. Due to its nature it requires specific handling procedures as well as a different approach to emergency and incident response. Mr. Van der Veen (Managing director of Falck RISC) quotes: "We were very pleased to execute this study. I truly believe the bottom line - for now - is that people who are in need of this knowledge and these insights are enabled to get professional upgrade LNG emergency response education and practical training. This gap should be given highest priority." This study is co-financed by the TEN-T Programme of the European Union and is part of the ‘LNG Masterplan for Rhine-Main-Danube' project. Mr. Van Dooren (LNG Masterplan Rhine Scenario Coordinator) states: "Emergency response organisations in the entire Rhine-Main-Danube area, ranging from Rotterdam to Constanta, will benefit from this study."